A low pressure in the Dakotas will spin up some warmer weather this weekend and early next week. The counter clockwise swirl in the winds will mean a southwest wind throughout the midwest which mean warmer weather! It is a week system s the warm up will not be much more than 5 or 10 degrees, but is certainly welcomed for many after the midweek snowstorm. Besides that, it looks to be a quite week in the midwest. Another snowstorm is possible next weekend in northern parts of the midwest (SD, ND, MN, WI). As of now 3-7" is possible, but it is still 8 days out so a good forecast is not easy. 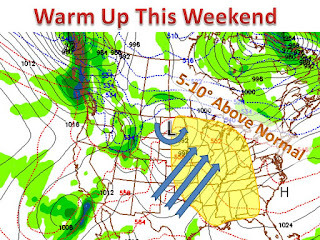 Never the less, a storm will be somewhere in the midwest next weekend, so stay tuned to midwest weather talk!